She continued. Bond said,"Sure, he's in the bar, want me to get him for you?" Ward went into the bar and in a few minutes John Wayne walked into the lobby, right up to Dorothy and me and to this day I can hear his booming voice and distinctive way of talking, "You kids want to see me," he asked. I shook his hand...the biggest hand I had ever seen. And, the nicest guy you'd ever hope to meet. I explained that we were high school reporters and we would like to do an interview. He invited us to sit down right there in the lobby and we could just ask him anything wanted...take as long as necessary. I can't remember the questions, much less the answers. I spent an hour asking everything I could think of and then I was dry. Dorothy asked for his autograph, which she still has. We thanked him and he went back to the bar. All I really remember was his patience and kindness to two high school kids. What a guy. He invited us out the the set to watch them make the movie. Dorothy didn't want to cut class, but, of course, that didn't bother me, so a buddy of mine, Gary Palant, and I went the next day. "Guests of the Duke," I said. The day we were there they were doing the funeral procession scene. I helped chase some of the chickens across the road in front of the casket. One thing I learned was how boring it was to watch them making a movie. All that action on the screen, but they just did one scene, over, and over again. We left after a few hours. What happened to the story we wrote for the school newspaper? It was rejected. Another kid had an interview with Dr. Joseph Wood Krutch from the Arizona State College at Flagstaff. and they didn't have room for two stories. The journalism teacher thought ours "wasn't educational enough, it was only about a movie star." an old high school friend, Dorothy McCutcheon stopped to visit me in Laughlin recently. 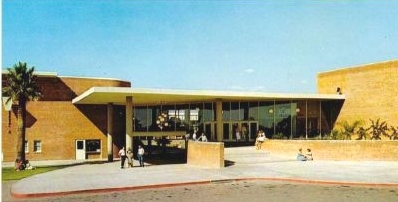 We had lunch and talked about some fun times at Catalina High School in Tucson. She was 2 years younger than me (still is, probably), and we had journalism class together as well as working for the school paper, The Trojan Trumpeteer. One spring day in 1958 we were given the assignment to interview someone; a life story type of thing. I told Dorothy that we ought to interview one of the stars in Rio Bravo, a movie they were filming then at Old Tucson. 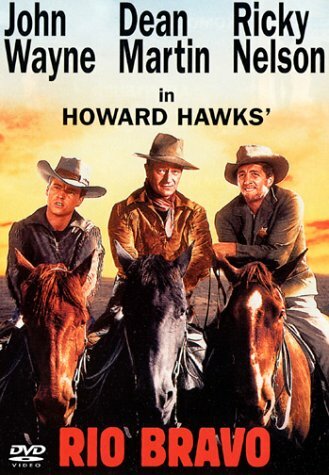 And, who better to go after than the biggest star of all, John "Duke" Wayne. I had just gotten my driver's license and so I drove us down to the Santa Rita Hotel, where the stars were staying. Dorothy said, when we walked into the hotel lobby, there right in front of us was great charactor actor Ward Bond. I strolled up to him and said, "Hey Ward, you seen the Duke?" She told me she was surprised at how bold I was. To tell the truth, I didn't even remember it. On arrival at the agency I was put in the care of a young guy named Ron Zeigler. I was really impressed because he was only 2 years older than me and already was a full fledged account executive working on French's Mustard and the all new, at that time, Sea World. This was Mr. Ivy League to the max. Striped blazer and smoked a pipe. In his office the first thing I noticed were autographed pictures of Former Vice President Richard Nixon. We talked politics. He told me about working on Nixon's California Gubernatorial Campaign that he lost in 1962. Immediately after the loss Nixon sourly blamed the press, claimed he would not run for anything ever again, and uttered the famous words, "You won't have Richard Nixon to kick around any more." Of course, in my astute political judgement I told him that Nixon was finished; we'll never see or hear from him again. Ziegler begged to differ and said he thought he would make a run for the Presidency in 1968. Well, he did, and he won, and took Ziegler with him to the White House. I spent the day with him. He told me he had just been to the NBC preview of new TV shows, and, "there's this hilarious new spy spoof where the agent has a phone in his shoe." He was talking about Don Adams and Get Smart. I also met and talked to future Nixon aide Dwight Chapin. He was MY age. I wondered how these people got so far, so fast. Later he told me he worked on the Nixon 1962 campaign, too. At the end of the day I was ushered into the office of the head man at the Los Angeles J. Walter Thompson operation. It was somewhat spooky. Very dark, except for one light on the man's desk. I was nervous because here was the guy who would decide whether to hire me or not. We briefly spoke in pleasantries. He asked about my experience. I talked about my radio and tv jobs. He explained that all the people who start with them in management training become assistants in the media department and I would have to move to New York. He asked how much money I would want to start. I said $700 a month. He said that was way more than they were willing to pay. Around $500 was usual. I explained that I deserved more because of my extensive background in broadcasting. He thanked me for my visit and that I would hear from them in a few days. And, I did. A nice letter thanking me for my time, explaining they decided they did not want to hire me, and wishing me good luck. I still have that letter. It was signed by H.R. 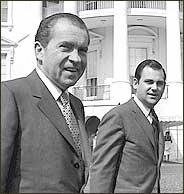 Haldeman, the man who conducted my final interview, and who would go on to be Nixon's chief of staff in the White House and actually serve time in prison for his participation in cover-up of the Watergate burglary. I never forgot that day with Nixon's future henchmen. How different would my life have been if they would have offered me that job! But, would I have taken it? He was President Nixon's press secretary and is known for coining the term, "It was just a third rate burglary," when referring to the Watergate break-in before we all knew what happened. He stuck with Nixon even after he resigned from office in disgrace. News of his death reminded me of the day I spent with Ziegler in 1965 in Los Angeles. He was an account executive with J. Walter Thompson Advertising Agency. I had been flown over from Tucson as a prospective candidate for their management training program. I was just about to graduate from the University of Arizona and had been interviewing with various companies. They liked the fact that I had media experience and decided to look at me more closely. President Nixon with Press Secretary Ron Ziegler in the late '60's. 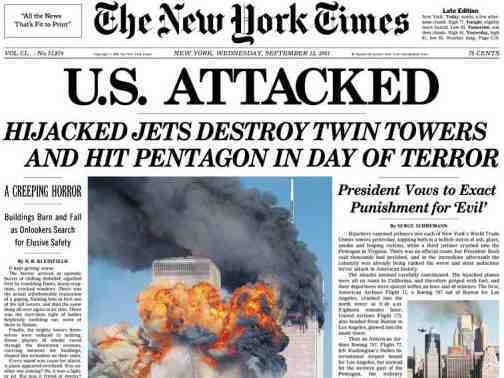 On this anniversary of Sept. 11, Americans will have a wide variety of feelings, which is just as it should be. What unites Americans has always been impossible to define precisely, even though we know there are many values and traditions that we share. As a journalist, I know it is my job to help provide people with the most accurate, clear and credible version of events, and let them draw their own conclusions. On a day like Sept. 11, we have at least two feelings that pull at our hearts: on one hand, we must defend the individual freedoms that have always kept us resistant to tyranny or oppression; on the other, we will feel great sadness for the many hundreds of people from all over the world that died on that day. My newspaper, the New York Times, has written about each one of them, with an individual sketch and photograph, to show the respect we have for their individual lives and contributions. After September 11th do Americans feel safe? That question is not so easy to answer. We feel ready to do what Americans have always had to do to live in a country based on individual liberty: We will make the country as a safe as we reasonably can, knowing no one is completely safe in a country that guarantees so much freedom to individuals. What is more important to us, I believe, is that we debate our political values and decide the best way to put our values into practice, and I think that is happening with more vigor than was the case before Sept. 11. There are conversations about the individual rights of, for example, airline passengers who for one reason or another come under suspicion. And of course, there are many debates going on about the rights of everyone who is arrested or detained for various reasons. There is no question that Sept. 11 has brought out the best in Americans, our willingness to sacrifice for the common good. I know two friends in Arizona, my home state, who are professional cooks. They recently cooked for the many firefighters who have been fighting large forest fires in the West -- they cooked for weeks, sleeping only an hour or two a day, as volunteers, to help the community cope with a crisis. That is just the spirit that Americans have shown in New York City, and across the country, when we responded to the crisis of Sept. 11. It has been a time to volunteer, to support the less fortunate, to debate the American values that some may have taken for granted before Sept. 11, all this while we take a few moments to mourn for the ordinary citizens and firefighters and police officers who are dead and to honor their memories. What's the effect on the US people psychologically and financially? Financially, I doubt many of us can even comprehend the numbers that are in the news about the costs of Sept. 11. We know it will be immense. But as human beings, we know that our own lives are changing permanently. None of us will ever be able to look up at the sky as a plane flies over on a beautiful day in the park or on the street without thinking of Sept. 11. It will be many years, decades from now, before we know just what the psychological changes will mean for all of us. Just as the lives of my parents were changed by the invasion at Pearl Harbor during World War II, the changes in our lives will become part of global history. But, there is another side. We have all come together in important ways after Sept. 11. We take time to listen to each other, to respond as we can to our human needs. Many of us are thinking more deeply about all of the victims of forces beyond their control, the thousands of children whose lives are taken each year for lack of clean, fresh water in the poorer countries of the world, the damage to the environment that comes from unwise use of natural resources, the lack of educational opportunities that so many in the world confront. Our own suffering has made us more sensitive to the needs of others in the world, and to the need for vigorous public debate of our own political choices at home. In my own case, my family was safe during Sept. 11 and since then. On Sept. 11 before 9 a.m., I was approaching the Hudson River from the New Jersey side opposite Manhattan Island, and watched for the last time the Twin Towers, intact against the clear blue sky. As I watched, I saw a bit of white smoke come from one tower. I said to my friend that the smoke looked dangerous. At first, he said it was nothing. Then as we neared the Towers, the smoke grew to a larger and larger cloud. The radio suddenly went off; the antenna that transmits many of the radio stations in New York is located on one of the Towers. Thereafter, a station whose transmission came from elsewhere alerted us of the news that a plane had hit one of the towers. We parked the car and walked out to our small sailboat, which we had planned to use for a morning sail on the Hudson. We stood on the boat and watched the smoke and flames grow in one tower. "We can fix this," I said to myself. Then flames appeared in the other tower; the plane had struck as we watched, but we didn't see it because the sky was so full of distractions. Before long, we saw one tower slide slowly, slowly down to the earth. My first thought was, "We can fix this the other tower." And I repeated those words until the second tower, too, shimmered slowly to the earth like a pillar of wet sand. "Do you have a boat?" The harbor was closed, we explained. But I offered to drive him along the Hudson River edge, through the police barricades with his firefighter's badge flashing out the window of my car. We found boats bringing the wounded from New York. We would ask if one of these emergency boats would take him across. We finally found a boat at the main square in Jersey City. He jumped out and went off, ran off, to board the boat, to fight a fire in which we suspected that many had already been killed. We had just heard on the radio that many firefighters and policemen had very likely died in the collapse of the buildings. He didn't come back that night. One of us watched his car the next day, and the next. We pledged to keep watching the red Jeep and trusting that he would return. Happily, this firefighter survived, and came back many days later for his jeep. But hundreds of other firefighters died. This firefighter's story is important to me. It shows the dedication that so many Americans had to help others in this disaster. They thought of little else. Now, since the event, we are debating every policy. What to do about terrorism? No one agrees completely. We are just thankful we have the freedom to debate policy freely, endlessly. History will judge whether we do the right thing this year and the next. What is important, I think, is that we protect our values and our individual freedom to think and debate. That is what I will be thinking about on Sept. 11, at 10:29 am as we have a moment of silence. Written for the Chongching Journal, a newspaper in Southwest China. The following two submissions are from Ray Lindstrom. This is "that" story for the grand kids. It's Feb/March of 1962 and I'm in my 3rd year of my enlistment in the Navy. I'm attached to a heavy attack bomber squadron in Sanford, FL. The squadron is assigned to a brand spankin new USS Enterprise CVAN 65. We went on board to make the shake down cruise with her. This is putting the ship, crew, and the squadrons through sea trials. Our squadron was also breaking in a new plane to the fleet. The A5A Vigilante, built strictly to carry a nuke and, more than likely, a one way trip. We were the first squadron on the East coast to get these planes. When we got down to Guantanamo Bay, four of us were offloaded and sent ashore. I was one of those four. In the event one of our planes had to land ashore rather than onboard ship, somebody would be there to service it. Air operations didn't take place every day. We had days of nothing to do, I spent a lot of time just noseying around the base. While doing that, I learned I could sign up to go out with the Marine Sergeant of the Guard when he made his rounds. So, I went over and signed up. When the day comes, we go out. If you saw the movie "A Few Good Men," that's the road we used. It was interesting and funny, on the other side of the fence were the Cuban soldiers watching us watch them. There were tall watch towers spaced about a half mile apart all along the road. At each tower there was a Marine sentry. The Sergeant would stop, chat for awhile and then we'd move on to the next tower. We get to one tower where there are several Marines on the ground and one up on the tower. The Marine up in the tower is looking at something on the Cuban side through his binoculars and reporting down to the Marines on the ground. The Sergeant gets out of the jeep and joins the guys on the ground. Since I'm not one of them, I'm kind of left out of the picture. So I climb up the ladder to join the guy up there. I get up there and we chat a little. "What do you see?" I asked. "Not sure," he says. "We know it's a Russian freighter, but we can't figure out what they're offloading." "Can I have a look?" "Sure." He hands me the glasses. I can see the freighter, but it is partially obscured by buildings and trees. I could see big items covered by red tarps. The Russians love their red tarps. The Marines had a radio and they were talking with some one about what they saw. I was not privy to any of that. After a while the Sergeant and I leave, we finish the round and I go back from whence I came. We get back to the ship and then back to Florida. Time went by, we got busy with other things and I forgot about that day with the Marines. Fast forward now to October, 1962. An order comes out that we have 30 minutes to go pack and get back, ready to ship out. Of course, we weren't given a reason. Just do it! Rumors flew like crazy. We get up to Norfolk, VA where the ship is. The next morning we cast off and slip out to sea. We still don't know what is going on and the rumors are flying. About mid-day all our planes show up and they all land safely. Finally, word comes down; Pres. Kennedy will be talking to us on TV. We all find a TV to watch. He tells the world about the Naval blockade we just formed and why. At the end of that talk one could have cut the adrenalin and testosterone with a chain saw. At this point I'm not sure of the time line and how many days we were on station. When the Russians began pulling their missiles, we'd fly recon over them. One day I saw a freighter with missiles on deck and they were covered with red tarps! I instantly flashed back to that day I spent with the Marines. Oh wow! That's what we saw that day! Up to that point, I completely forgot about my day as a Marine. So, that's my story for my grand kids. Thought I'd share it with you. Also, serving on board the Enterprise with us but with a different squadron, was a young hot shot pilot by the name of John McCain. The older I get the more chilling the realization of how close we came to destroying the world. I wonder how close we are to that point now? I have always been a radio fan and was delighted to find a kindred spirit in Ray Lindstrom, who rode with me on the Tanque Verde Bus to Catalina in 1956. We started our own radio show broadcasting to the captive boarding school audience at Treehaven School, a boarding and day school my parents ran. After testing our patter on the preteens, we were ready for the big time, the sophisticated Catalina High School audience. I can still hear the groans of fellow students during lunch hour as they heard "It's time for the Burt and Ray Show" broadcast from the janitor's closet in the cafeteria. Although I never followed friends Ray Lindstrom and Gary Palant to "Color Radio 99," as KTKT billed itself, I had a brief stint on 1490 KAIR, Tucson's fresh air whirling sound of country music." The going pay was 85 cents an hour and an occasional 45 rpm record which no one else at the station wanted. The studio was located on the mezzanine of the Santa Rita Hotel and in those days the average song ran about three minutes, not much time to get to the men's room during a long shift. (I worked 12 hours on Sundays). That's where Marty Robbins' "El Paso" and Wink Martindale's "Deck of Cards" came in. A knowledgeable listener knew what was going on when one of those seemingly interminable records was being played. It was fun to be on the air, cueing up records, and cutting transcriptions. An occasional appearance at a sock hop or wearing a borrowed station blazer gave me almost as much pleasure as playing the music or talking to the girls who called in to the station. My interest in radio continued beyond high school. I majored in broadcasting at Boston University, served in the Navy with Armed Forces Radio in New York and in Taiwan, and worked for several years as an announcer for various Tucson radio stations before doing some writing, having my own business, and then eventually working for American Airlines, from which I retired in 1997. Even today, I host a weekly classical music radio show on the University of Arizona's FM station. 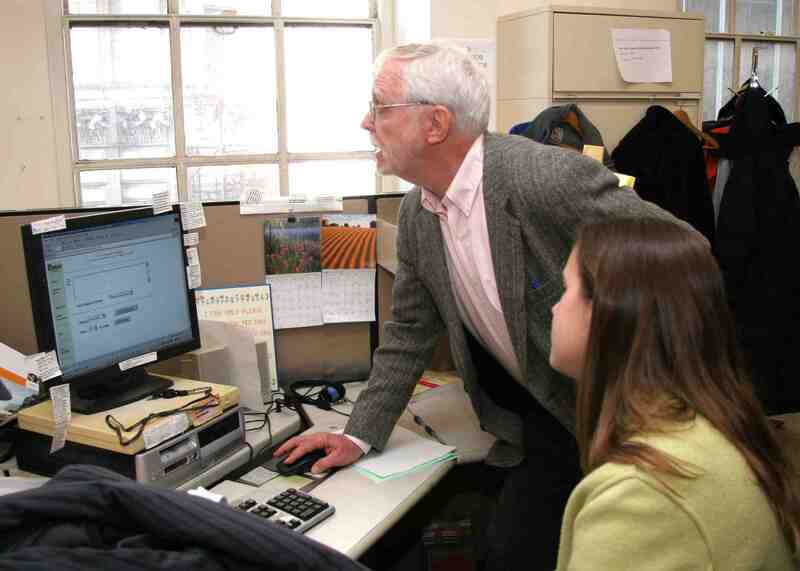 Webmaster note: Gene Hammel has some fascinating stories from his exciting career in Washington, D. C. You'll find them on his personal page. Check them out by by clicking here. Gaylon and I spent an enjoyable two hours with Ray Lindstrom last month in Laughlin catching up with what has been happening in our lives. Little did I know that I would leave the visit with a writing assignment. Ray found my "Quilter's Husband" stories interesting so that was my assignment. Back in another life, I would frequently travel to different spots around the world to audit gold mine analytical laboratories. One of the mines was located twenty-six miles south of Lake Victoria in Tanzania and I visited there two times a year. 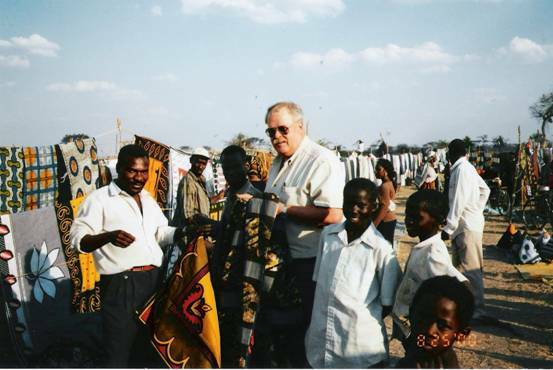 That trip was definitely a test, 32 hours from Elko, Nevada to Dar es Salaam arriving at midnight on the second day. Then up at 4:30 A.M. and back to the airport for a two-hour flight to the mine. On the first trip, I mentioned to one of the lab guys that I always bought local fabric for my quilting wife when I traveled. He said that would be no problem since market day was on Friday. 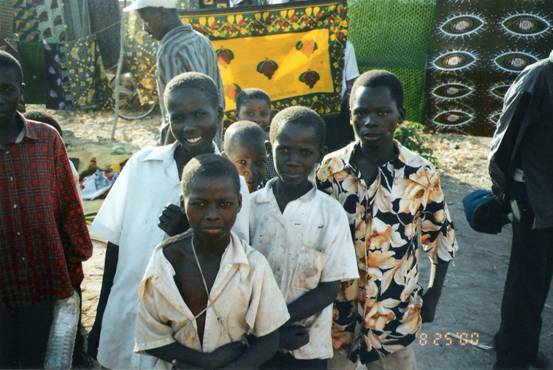 The village of Kacola is less than a mile from the mine gate. Before the mine opened, it had a population of about 800 people and now has more than 6000. Much like the boomtowns in the American west, the mining economy attracted the entrepreneurs. We took one of the bi-lingual laboratory technicians with us and drove into town. When we arrived at the open-air market, it was an absolute mass of humanity. We left the car and started walking back into the crowd. As soon as we started, a band of curious kids surrounded us. It was obvious that they had not had much exposure to white people as they all wanted to touch my bare arm. It gave me a new understanding of the term minority, as we were two white guys in a crowd of more than 1000 black people. was displayed on lines in two-yard pieces. One of the local guys told me that there are numerous ways to wrap the cloth around the body for a different look. It was an interesting experience, much different than going to the local Wal-Mart. During a recent visit to Tucson to see Arizona play UCLA in basketball (U of A lost! ), I spoke with our classmate, Ford Burkhart about my oldest granddaughter Mackenzie's interest in writing and journalism. As we know, Ford is a professor of journalism and a Foreign Desk Editor at the New York Times. Ford graciously offered to give Mackenzie an insider's tour of the Times offices should we ever be in New York City. 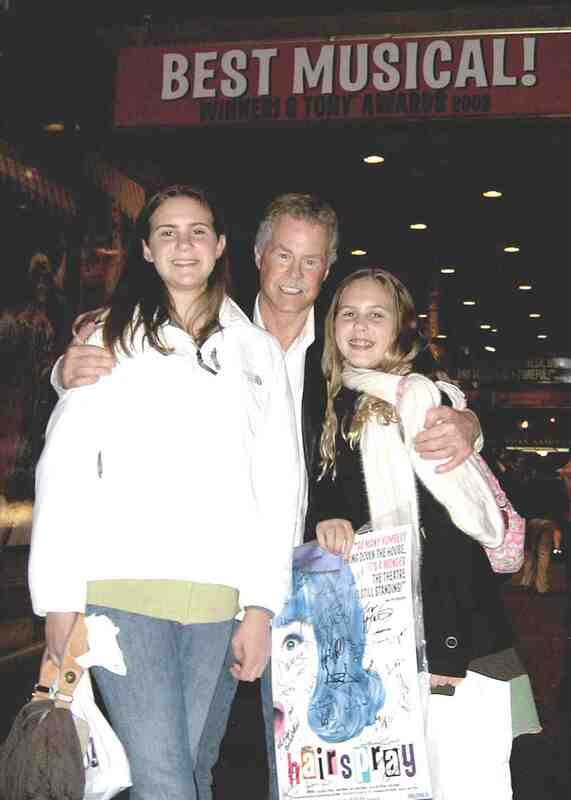 In March 2007 my daughter Cheryl and my two granddaughters, Mackenzie (age14) and Libby (age 12) and I visited the Big Apple during spring break. 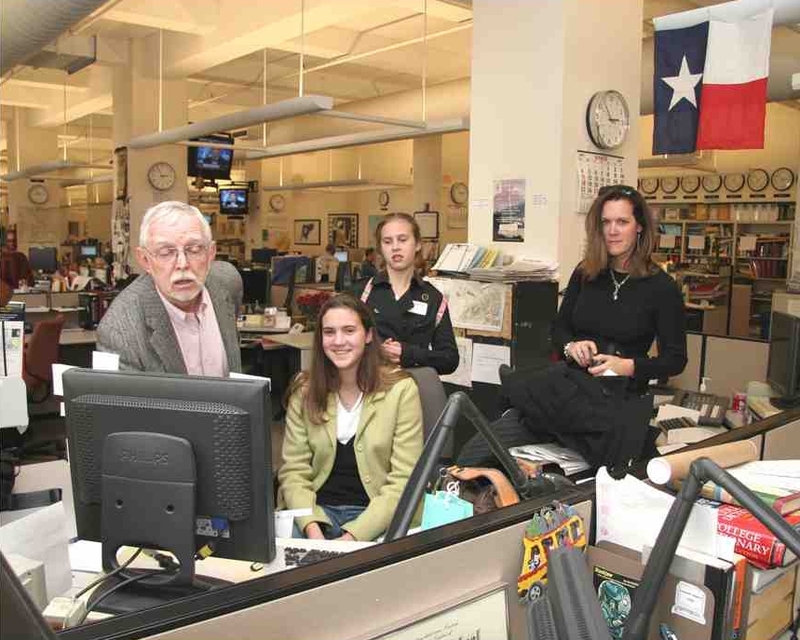 Thanks to Ford Burkhart, Mackenzie's wish to visit a big time newspaper office was about to come true. Arriving at the New York Times offices on 43rd Street mid afternoon on the first day of Spring we informed the security guard at the desk in the lobby that Mr. Ford Burkhart, Editor, was expecting us. After receiving our "VISITOR" nametags we took the elevator up to the third floor where we met Ford. Prominently displayed on the wall of the third floor lobby is an oversized copy of the first-ever edition of the Times dated in 1851. After we read the front page of that first edition of the Times Ford explained a little about newspaper operations and the intense competition among the news agencies to report the news and increase sales. We were then treated to a most memorable "behind the scenes" tour of the Times offices. As we walked around the Third floor offices Ford explained to Mackenzie a little about what life is like in the day of a journalist (very hectic). We also had the opportunity to meet several editors and journalists. As we rounded one corner of cubicles, I spotted a sign on a column wall titled "Week in Review", my favorite section of the Sunday Times. As Ford was emphasizing to Mackenzie how important extensive reading is to a journalist's knowledge base, I noticed a string of Christmas chili lights hanging over the desks in the Week in Review section and wondered why they were there. 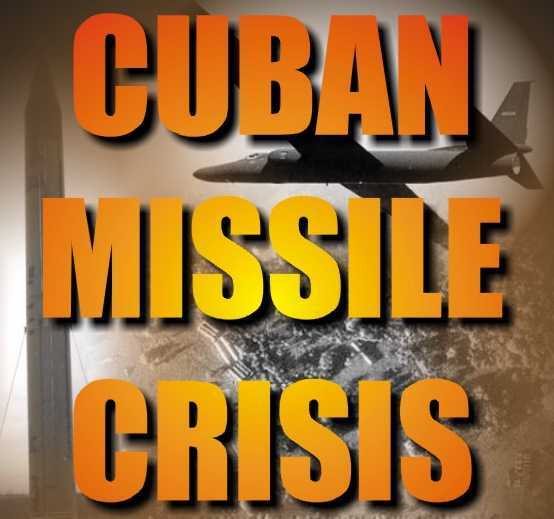 The cubicles were literally strewn with stacks of magazines, documents and books, sometimes piled several feet high, calendars, post-it notes, family photos and about anything made of paper. I took a few photos after Ford said it was okay (I am not sure everyone else sitting at those desks would have agreed). In one photo I snapped inside the Times offices I counted 13 clocks! (Ray Lindstrom would have been envious!) Ford explained that clocks (displaying time zones from around the world) are everywhere in the work areas since deadlines are critical in the news biz. But he never did explain the string of chili lights! It was interesting to learn from Ford that the first thing a journalist checks in the morning edition of the newspaper is the "Corrections" column to see if any inaccuracies had been spotted in their published articles. One of Ford's responsibilities as an editor is to create those catchy headlines for articles written by correspondents. Ford explained how the headline really "sells" the story but cautioned that hastily written headlines may sometimes convey an unintended meaning and shared with us a couple of humorous examples. I had always thought that journalists were pretty independent but learned from Ford that there actually is a great deal of teamwork involved. The correspondents and editors exchange drafts of stories prior to publication and participate in frequent meetings to discuss content, context and readability. A few days after our visit to the Times when we were on our way to the airport I asked my granddaughters what was their most memorable experience during their visit to the City. 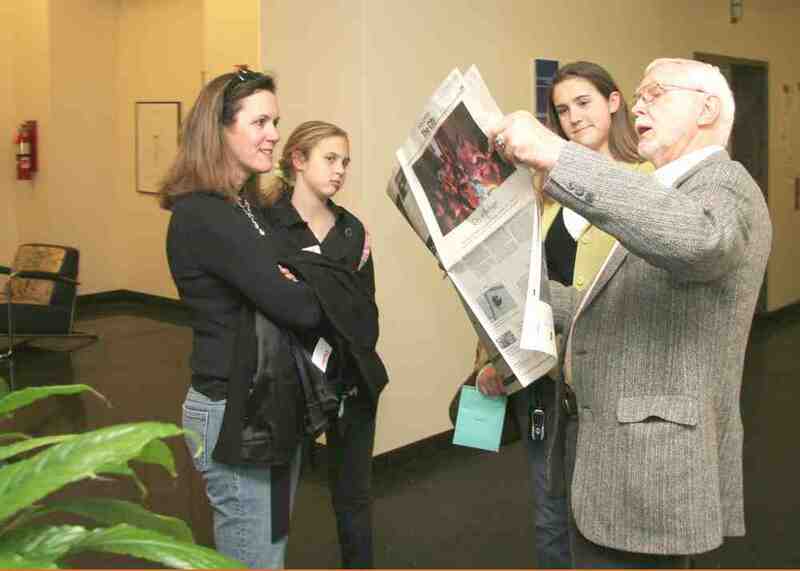 Mackenzie stated without hesitation, that the tour of the New York Times offices was her favorite memory. My youngest granddaughter Libby smiled and said the visit to the Times was "fun" but she would still have to vote for seeing the musical Hairspray. I guess we can't all be journalists! Many many thanks to Ford Burkhart for taking time out of his busy day to create very special memories for me and my family and for his encouragement of Mackenzie's passion for writing.